I will never forget the moment my precious baby boy came into this world. I will never forget the pride and emotion that filled every ounce of my being the second I heard him cry his first cry. I will never forget my first glace and how I thought he looked like a chubby version of Kate. I will never forget the fear I felt when he was whisked away to the NICU when he was an hour old due to labored breathing and issues due to CAMT. I will never forget the sheer determination I had to stand up and walk within hours of my csection so that I could make the journey to the NICU to be with my son. I will never forget the pride I felt as my husband completely cared for our son during the first 24 hours of his life as I was separated from him. I will never forget the way my heart doubled. Literally grew in size, the second I welcomed my precious baby boy into this world. I will never forget the first time Kate met her brother. The love she had for him. The hugs and kisses she gave him. I will never forget the excitement I felt when I brought my precious miracle baby home. I will never forget our amazing first year as a family of four. I will never forget the fear I had, and still have, for my son and the fight he has ahead of him. I will never forget his first smile. The first time he rolled over. Sat unassisted. Took his first steps. I will never forget cuddling him in the wee hours of the morning as he refuses to sleep. I will never forget the first time he said momma. I will never forget just how perfect this year has been. But most of all, I will never forget the peace he has brought to our family over the past year. The joy he has brought to our lives. The love he has shared with each of us. Happy first birthday my love. You have taught me so much this year and have been, and continue to be, such a blessing to our family. Thank you for being just what we needed. I needed your precious spirit to help be through some of my darkest days. Your daddy needed a buddy, a son. Kate needs a partner in crime that truly understands the journey she has taken, the fight she has won. The Lord knew what He was doing when he brought you to us. He knew we needed you, probably more than you need us. We love you and will always fight for you sweet boy. I love you now; I will love you always. Has it been a year already?! Best wishes for the coming year. What an awesome picture of him! You are in our prayers every single day. What an amazing picture of him. We will be praying for you as you begin treatment soon. Happy Birthday, Will! Such a sweet post. That is an incredible picture! Such an amazing picture! Happy birthday to your sweet boy! 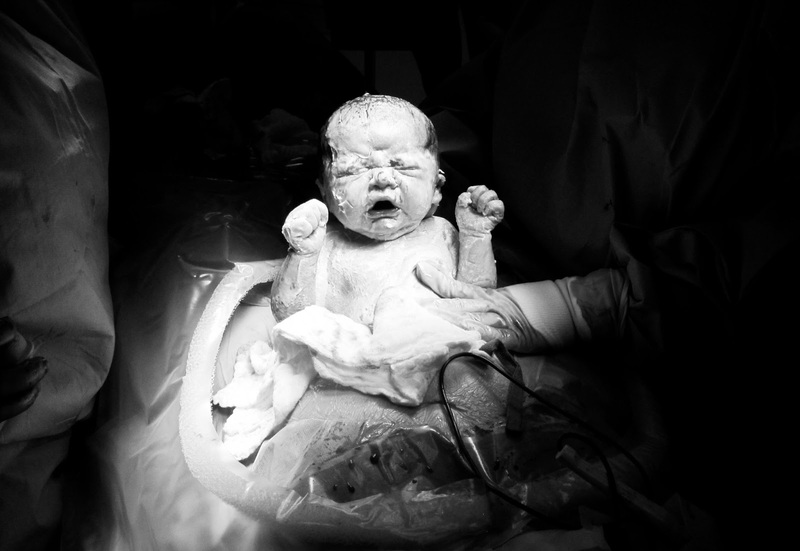 That photo gave me the chills- what a beautiful, amazing, breath-taking photo of a baby's first moment! Hope you have a wonderful time celebrating today! Happy Birthday Will! I cannot believe you are ONE!! It seems like yesterday your Mommy told me about you! Love and hugs from Wisconsin!! Oh, I am tearing up reading this...I know there will probably be a day in the future blogs will be passé, but I will never forget your family's incredible journey. Sweet Will and Kate will always have a place in my heart-they are precious children with an amazing momma!! Beautiful! Happy happy birthday to your sweet baby boy! Wow I followed your blog when you first had Kate, all the way through her BMT and discharge to home. I prayed for your family throughout that time, and will start praying again. Praying for no complications for Will and that all goes quickly and smoothly and that God works miracles in all of the situations that arise. God bless!! !